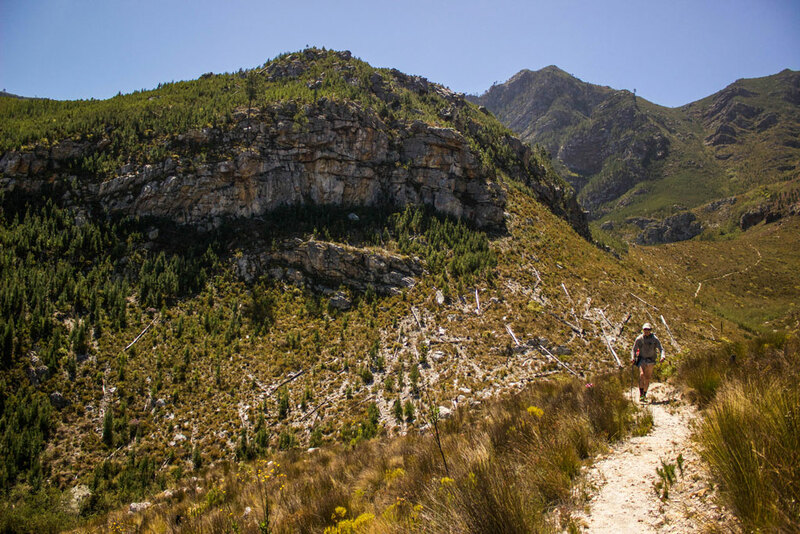 The Genadendal Trail is a fairly tough two-day hike with little shade, but the flower-speckled mountainsides, interchanging views and refreshing swimming holes make it memorable. Technical rating: Standard trail walking with some steep inclines and declines. 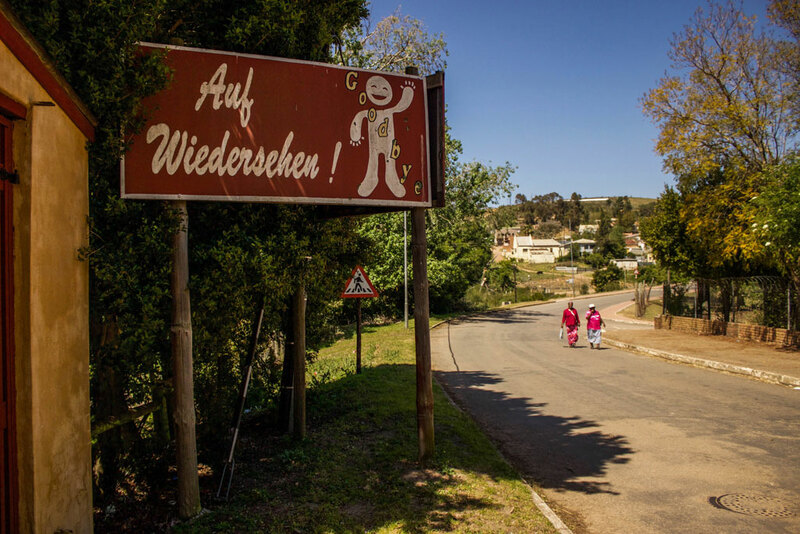 The small town of Genadendal, lying just 5km from Greyton in the Western Cape, isn’t well known, but it has a fascinating history. It was the first mission station in Southern Africa and Nelson Mandela renamed the president’s official Cape Town residence after the small town. 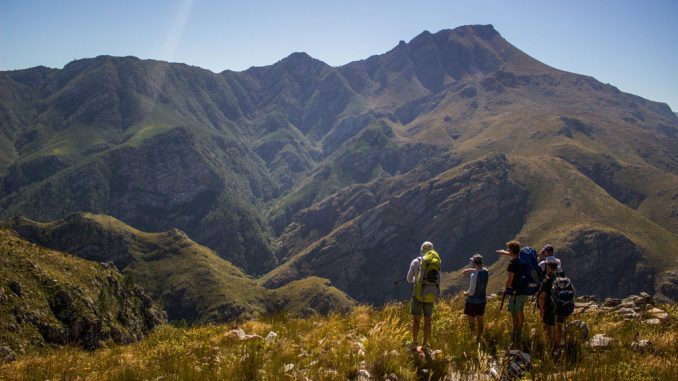 It’s also the starting point of a two-day hiking trail that winds its way up and over the Riviersonderend Mountains and down into the Robertson Valley on the other side. 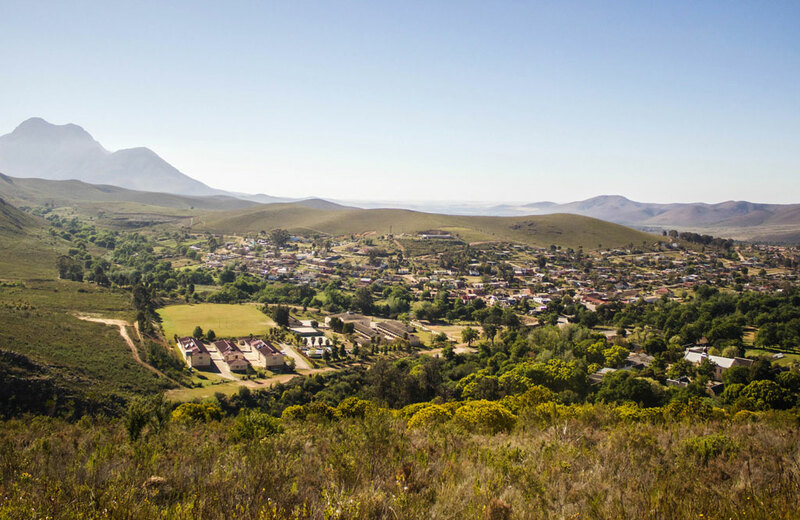 Looking down on the town, it’s easy to understand why Genadendal was an attractive place to settle as water and building materials would have been readily available. The mission was started under the cluster of trees at the bottom right of this image. 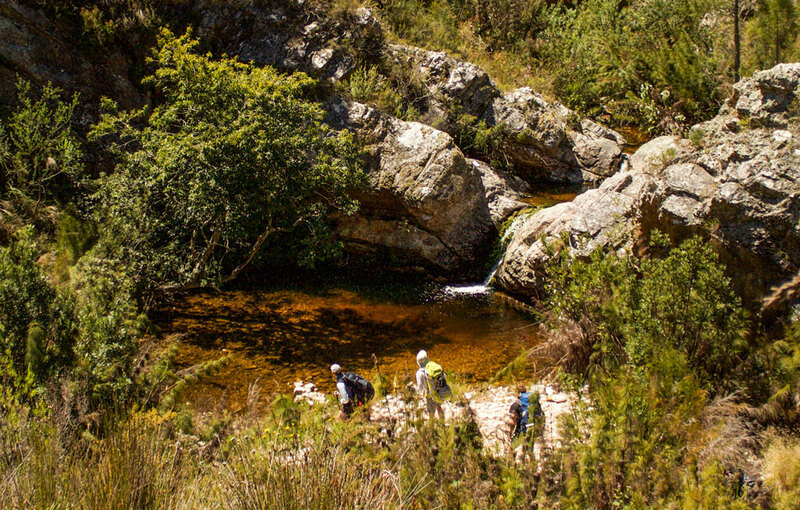 This beautiful overnight hike traverses the Riviersonderend Conservation Area, which is 70000 hectares of rugged terrain, disappearing gorges, and gurgling mountain streams. 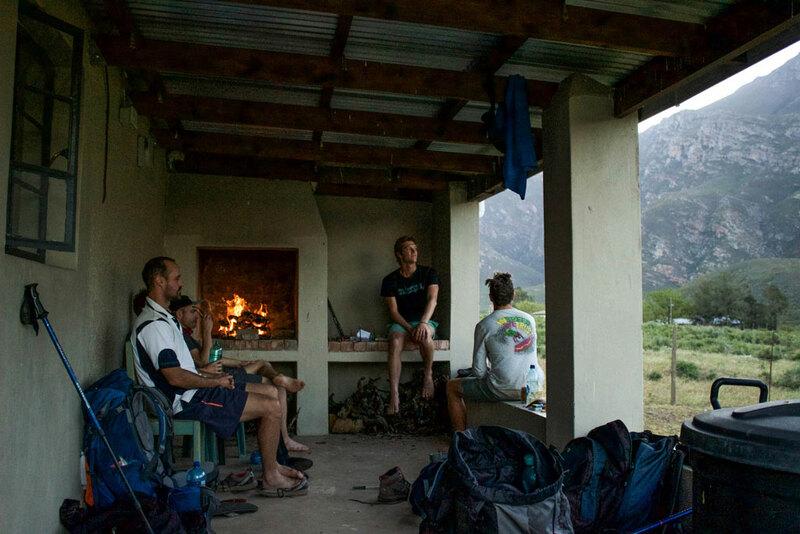 You spend the night in a farm hut and then return to Genadendal on a circular route. 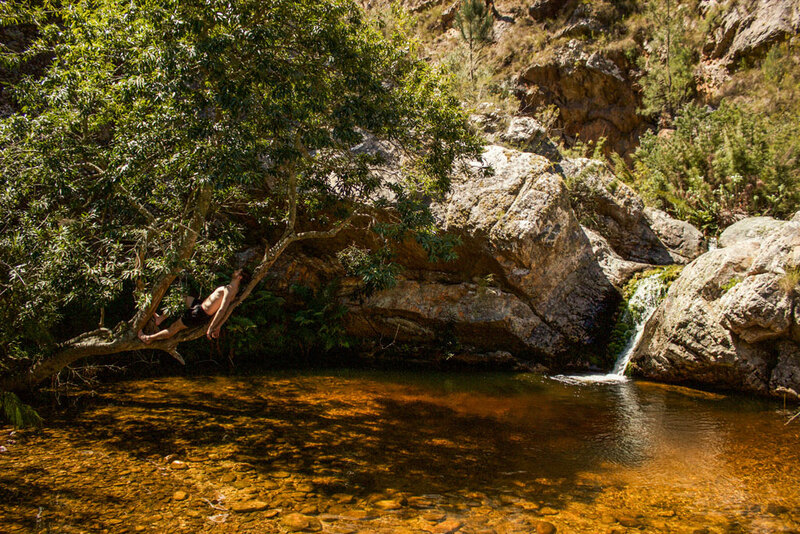 Genadendal lies at the confluence of two rivers that join to form the Baviaansrivier and was founded almost 300 years ago. 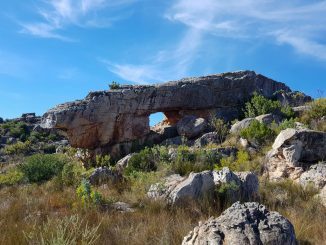 In 1738 a German missionary of the Moravian church, Georg Schmidt, arrived in a region known as Baviaanskloof (Ravine of the Baboons). Schmidt encountered an impoverished and dispersed Khoi people and set about teaching them to read and write. Today the centre of town is run by locals as a community project. They care for a museum, the water mill, a printing museum, a bookshop and country-style accommodation, which is rented to visitors. 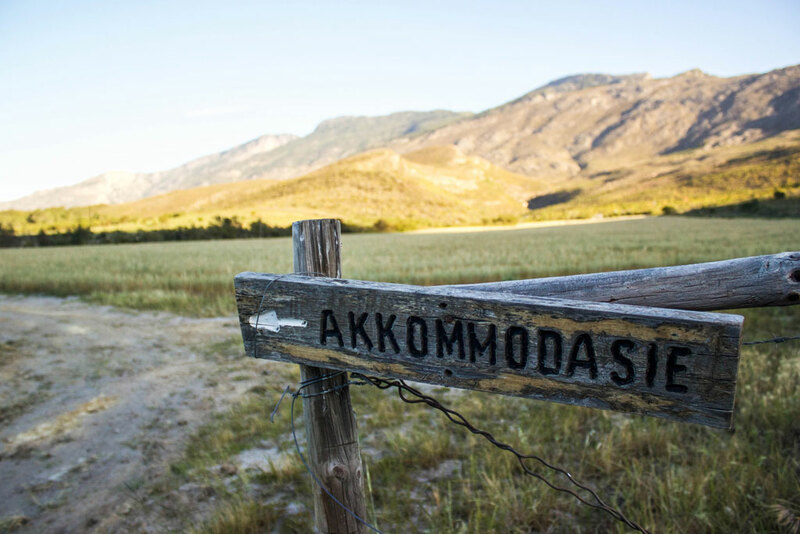 Arriving on a Friday night, we had a meal in Greyton, and spent a night in dorms at the Moravian Mission Station. On a bright October morning, we left at 08:00, passing a national monument on the way out of town. 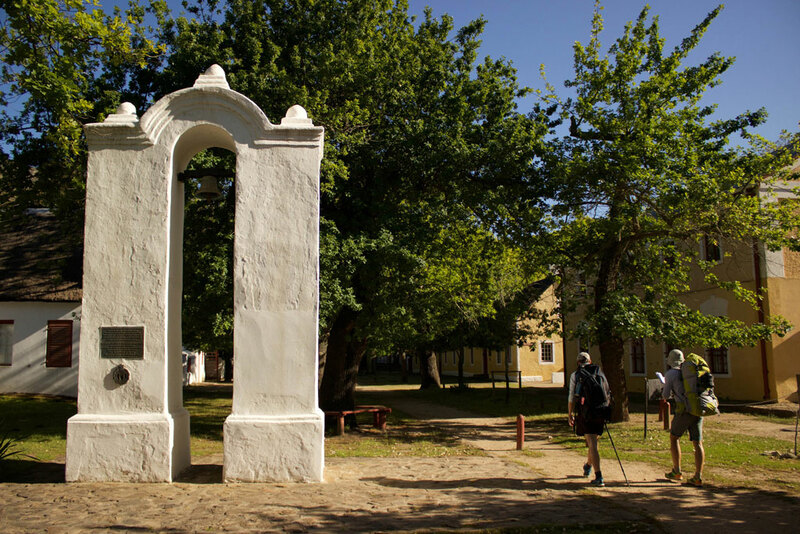 A national monument in the Genadendal werf at the start of the trail. 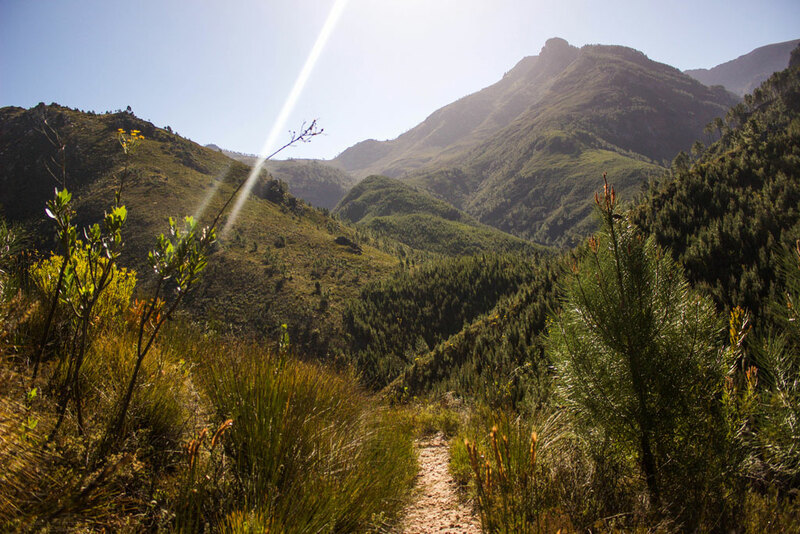 The Genadendal Trail was launched about 15 years ago, but it follows paths that are hundreds, if not thousands, of years old. 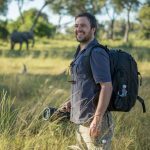 I photographed each stage of the trail to give you a good idea of what to expect. The reserve is full of pines that have proven stubborn and nearly impossible to completely extinguish. We encountered the first of many at a shaded spot where we had a mid-morning snack. After the snack, we traversed a plateau thick with yellow flowers that stood on the side of the path like supporters of a marathon cheering us on. 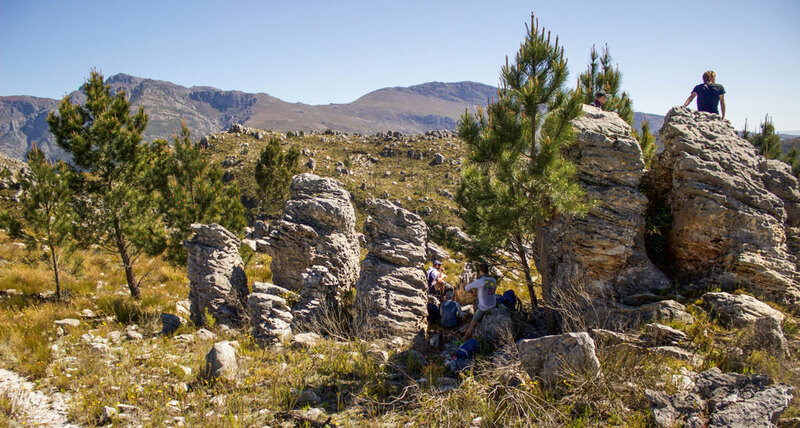 Wonderklippe is a section of the hike with interesting rock formations. They stand very tall, upright and alone, like totem poles or massive, single cricket wickets. We eventually arrived at our much-anticipated lunch spot, Groot Koffiegat. The water was deep enough to dip in properly and it was wonderfully, frighteningly cold. We were halfway and decided to spend a few hours at the water snoozing, eating, and swimming so that we could complete the day’s hiking in the cool of the afternoon. Henri certainly wasn’t going anywhere soon. The scenery after lunch drew a spate of comparisons to North America. Most of us haven’t even been there, but it perfectly matched what we imagine the far-off continent to look like. We were half-expecting to see a grizzly around the next bend. Our accommodation for the night lay in the valley below us near the dam on De Hoek Farm. Late in the afternoon, we still had a fair way to go. We descended from the pines, through a picturesque valley that dropped us off at the boundary of the nature reserve and the farm. We followed jeep tracks through interleading paddocks with helpful signs showing us the way. After a relatively tough day, we finally made it to camp. Our very long swimming stop at Groot Koffiegat had turned the seven-hour hike into a ten-hour one. 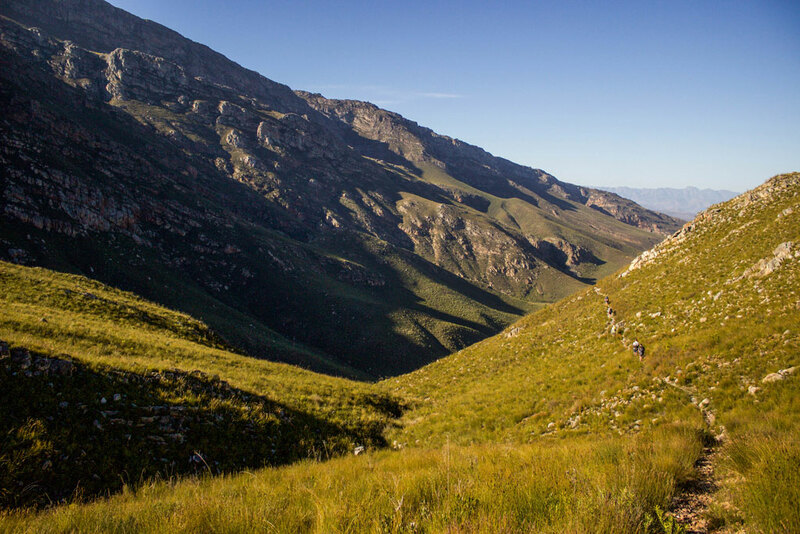 The accommodation on the trail has recently been renovated and there are now three new huts, each catering for eight hikers. 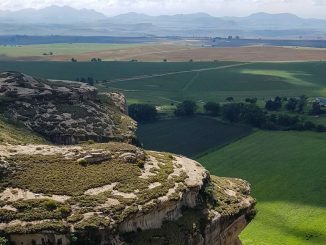 There is warm water, a fridge, braai wood, and the farmer can even arrange braai meat, drinks, and milk for you with due warning. After a good sleep we set off again. 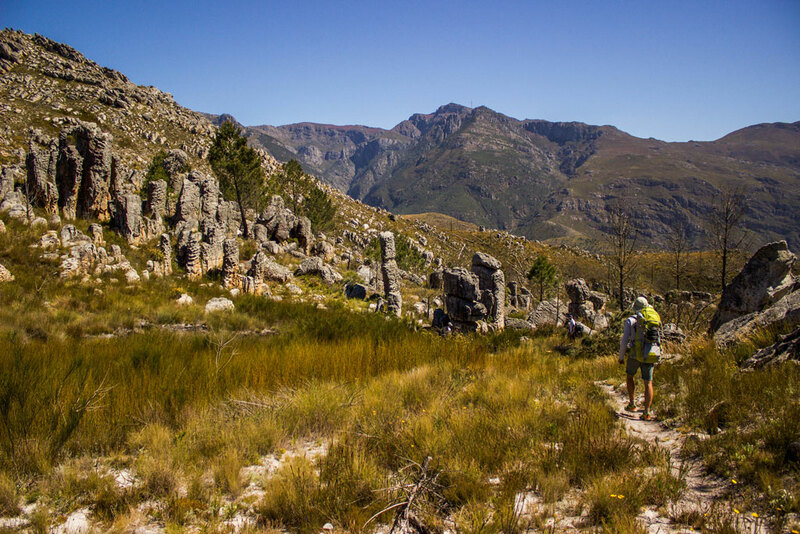 The two-hour climb with no shade on day two was probably the most challenging part of the hike, but we knew what to expect thanks to the sacred hiking text of Mike Lundy’s Weekend Trails in the Western Cape. You can see our trusty companion, Mike Lundy’s Weekend Trails book, is at hand for easy consultation. 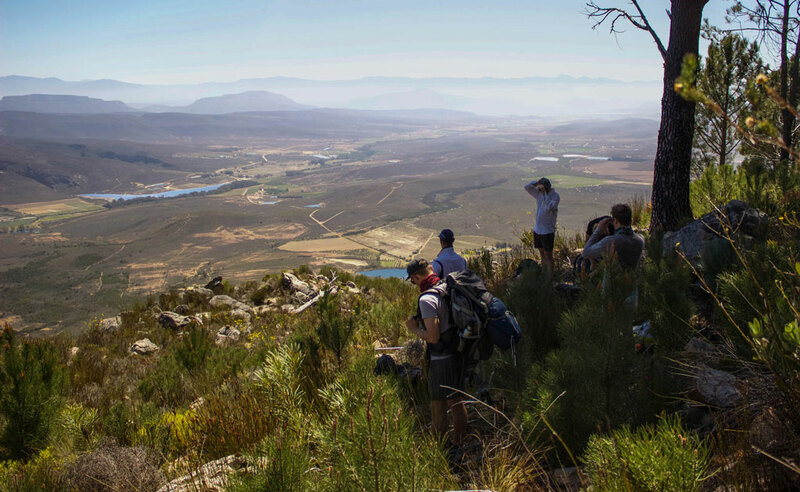 Mike is a Cape hiking legend and his words have guided hikers for decades across the region. He was, in fact, part of the original clearance party that broke the Genadendal trail back in 2002. My friends and I discovered the book about a year ago and are slowly ticking off the different hikes. We’ve completed nine of the 24 thus far and hope to do them all within the coming years. After that, we’ll probably be ready to start all over again. Different flowers popped up on every section of the hike. Scatterings of yellow, orange, pink, purple, and blue added bursts of colour to our path. At the top of the incline, we found sanctuary in the shade. 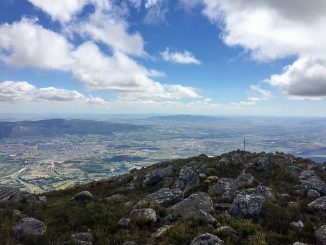 We snacked and regathered ourselves while looking out over the valley below us with the towns of McGregor and Robertson in the distance. On top of the mountain was a forest of pines as thick as the bristles on a hairbrush. The young trees seemed to grow on top of each other and it was a good example of just how destructive pines are and how other vegetation has little chance to survive alongside it. It was our highest point over the two days. 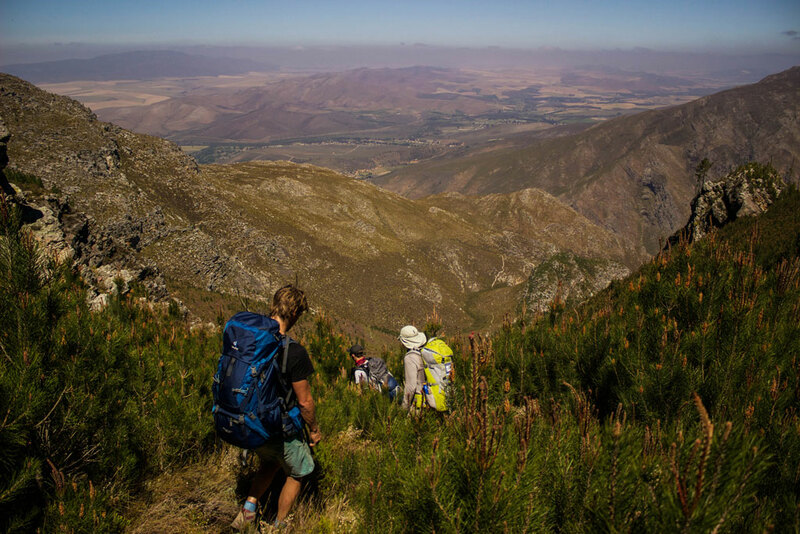 We popped out the other side and started our descent back to Genadendal. 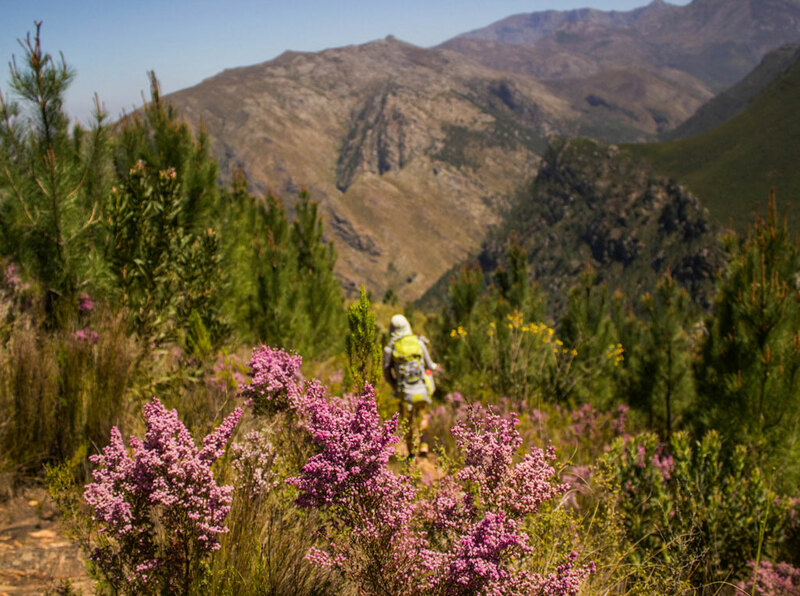 As the pines thinned out, the path levelled, and purple plants of Cape heather showed us the way down. Looking back we could see the mountain we had just scaled, the sandy path that led us down and felt the sense of satisfaction that comes with the simple joy of climbing a mountain. As Mike Lundy wrote, the trail is, ‘demanding but beautiful.’ The best hikes always are. Back in the small town of Genadendal, local ladies were dressed smartly, gathering for a church service. We took off our shoes, threw our bags in the cars and waved them goodbye. 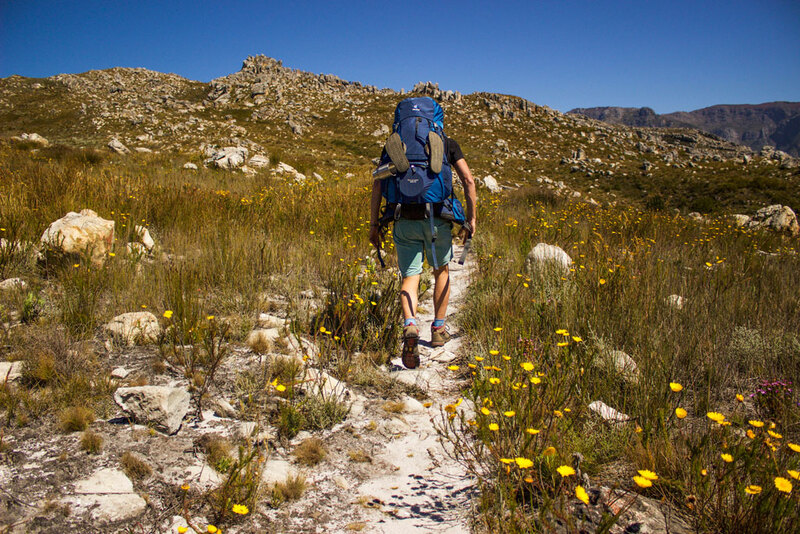 Our tip: There is not much shade on the hike so be sure to take a hat, sunscreen, and plenty of water. We rued not arranging cold beers to be waiting for us on the Saturday. I definitely recommend considering that. 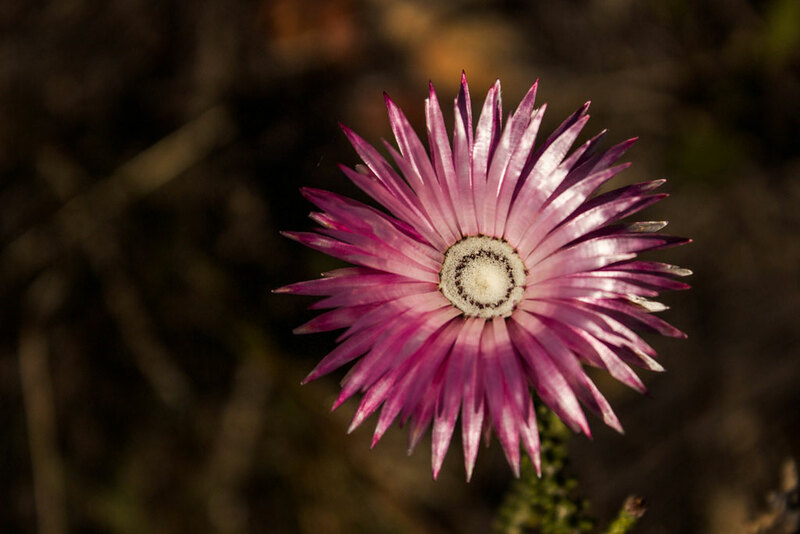 Call CapeNature on 0214830190 for permits. For Friday night accommodation in Genadendal phone 0282518346. For the Saturday night on De Hoek Farm phone 0236262176. This article was originally posted by Getaway. 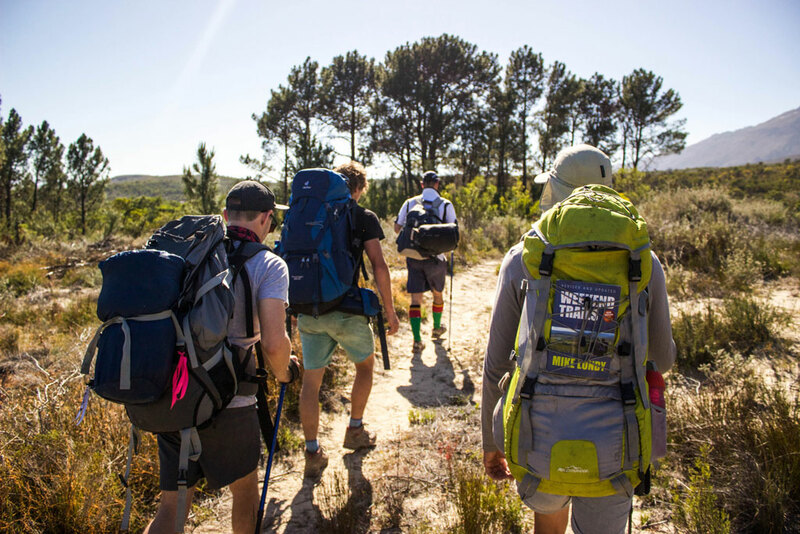 Make use of our Multi-Day Hiking Checklist to help you pack all the essentials and always practice the Leave No Trace Principles to ensure sustainable enjoyment of the outdoors. We did this hike over new years. Its was beautiful, but a toughie, I think we had the hotest day of the year. Groot Koffiegat was awesome, had a lengthly lunch stop. The farmer house was great, we arranged braai meat and beers for the night along with breakfast and lunch. Super friendly and accommodating with our long shopping list. Its a great hike, but the heat made it tough and was grateful for the lighter packs. Day 2 – down through the pine saplings was not easy, alot of the path was difficult to navigate, so not for the jeep-track and manicure-path hiker.